Christmas rolled in here on chilly billows of dense fog. 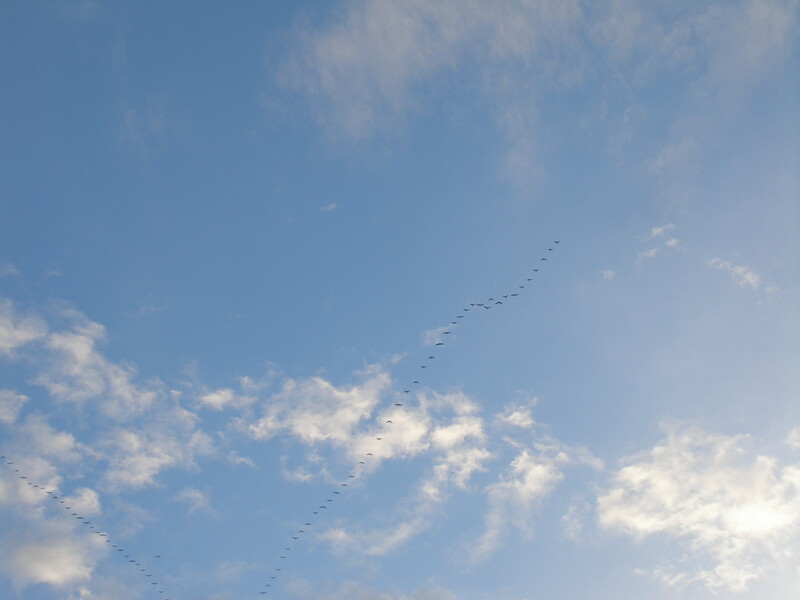 A normal late-December day. Not that the animals expect the day to be any different from their usual routine and, with the exception of a heartier-than-usual dinner, neither do we. Our household now consists of two adults of a certain age, one of each gender; two young cats, ditto, and two horses, one in his teens and one in his thirties. None of us are religious. We believe in doing as you would be done by (old dictum, please don’t write in about the grammar), honesty, kindness and cleanliness (up to a reasonable point). Of course our moral code is probably a lot more complicated than that, but, having suffered a childhood surfeit of Christian catechising, the humans in this family are pretty sceptical of the competing rules dreamed up by all the races of mankind seeking to explain the universe to themselves. Though this doesn’t us prevent us from harbouring a gut feeling there are forces far beyond the power of our puny apprehension – which may or may not care what happens on this benighted earth. Anyway, enough of all that. I’ve no wish to offend anyone’s religious sensibilities, since religious sensitivities are already responsible for enough trouble in this world. And until someone’s religion is definitively proved to be right, I reckon everyone should be allowed to think for themselves, follow their own traditions and respect each others’. Easy, right? So, where was I? Oh yes, Christmas. Though we were raised to celebrate the birth of the Christ child, and we can still get teary in a knee-jerk, involuntary fashion, when the old hymns are sung and old memories of Christmas past are evoked – we don’t attend services or have religious symbols in the house. And if, like us, you have no family members living in the same hemisphere to spend the day with you, you too may feel that decorating the house in yards of moulting tinsel and glittery artefacts of dubious creative value, cutting down innocent conifers and spending money you don’t have to enrich corporate conglomerates and so oblige your giftees to do the same is all rather pointless, (and at the very least ecologically dubious). Sometimes we invite unencumbered friends to join us for a celebratory meal, but if we are alone then we are unashamed to shun the commercialised brouhaha of the “festive season”. We send cards, if only as a good excuse not to lose touch with old friends who need reminding of our existence, but we have long since stopped buying and giving presents. Even to each other. After the incident of the horizontally ribbed heavyweight cream sweater that gave me all the allure of the Michelin Tyre man, (many decades ago when I still had aspirations to some kind of allure) I persuaded my husband that though I really did appreciate the thought, I would prefer that the thought remain in his head. We have since cleaved to the very practical system of nominating any joint or singular purchase requiring purse-clenchingly large sums as Christmas or birthday presents, whatever time of year they are bought. Thus, one year, a vivid orange tractor skip, which would never have fitted down the chimney, let alone under the tree, was left in the barn by agents of Santa sometime in Summer, likewise a very elaborate saw-bench with intriguing capacities which we are still trying to decipher. This year we were being very minimal indeed. Apart from hanging Christmas cards from some festive felt ribbon and unearthing a couple of sparkly reindeer and a minuscule gilt tree no more than ten inches high, I was feeling completely Bah Humbug about the whole thing. Then two unexpected things occurred to stir up our anticipated cosy, low-key Christmas day. Firstly, a friend whose family plans had fallen through cornered us with the plea that we HAD to join them for Christmas lunch as, a) an unfeasibly large turkey had already been bought to cater for large numbers and, b) her son, whose birthday falls on the 25th December was feeling rather flat at the prospect of spending it in a foreign land with only his Mum and Dad. So, along with other random friends, we were required to notch up the Christmas/birthday spirit, in numbers at least. Since it would have been churlish to refuse and doubly churlish to turn up empty-handed, we accepted gracefully and scrambled to the shops. Luckily, I had already made a large Christmas pudding that I could take, with other stuffings and sauces, to the feast. So, on Christmas morning we rushed out to the barn to wish the horses “Merry Christmas” – and feed and muck out as usual – before setting off to join our friends, only to find a second surprise in store, lurking in the muck-heap…..
A young wild boar, a “marcassin” as the young “sanglier” are called here, had snuggled down into the warmth of the muck-heap about 10 yards behind the back of the barn. Not more than about 2 feet high, a rich conker brown and very hairy, he must have been from a 2017 litter. We presumed he had been orphaned by the hunters who had been active in our vicinity in previous weeks. They (the wild boar) usually stick together in family groups and our neighbours had seen a band of four or five grubbing up fields and gardens on our lane. We’d even had damage in our garden, though we have finally resorted to what seemed like impregnable fencing close to the house – impossible, however, to prevent damage to the fields! 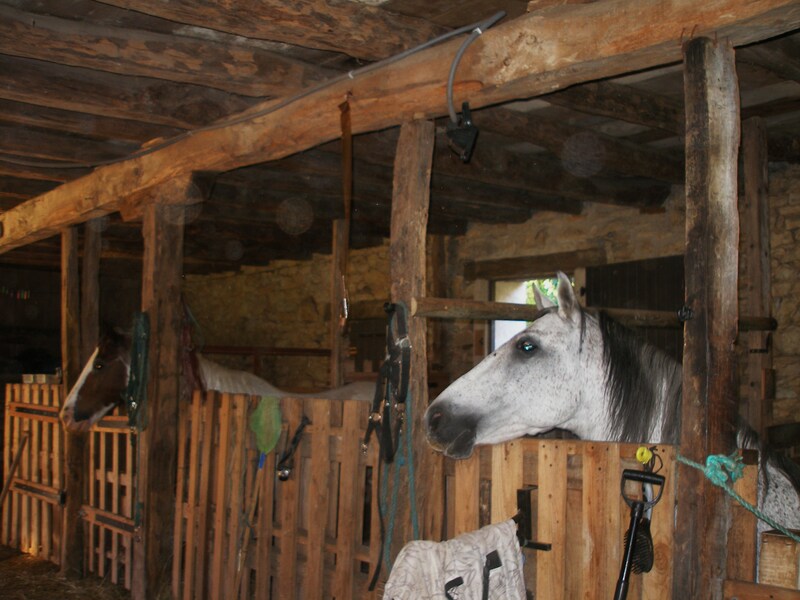 To get to their fields from the barn, the horses had to pass the intruder – with much snorting and brio – whilst the little chap remained hunkered down, beady-eyed and ears twitching. There was little we could do at this point, other than check that the fencing was secure, the horses were safely away and the barn was well shut up, as we needed to get changed and drive over to spend the rest of the day with our friends. The next few hours passed enjoyably and we were back home to bring the horses in before dusk, fully expecting the visitor to have scarpered. But no, there he was, burrowed further in and making himself even more comfortable. And there he still was, the following day. By this time, we began to imagine that he might be injured or ill. A few years ago a smaller marcassin had spent several nights in the horses’ field shelter before finally expiring there. We tiptoed nearer and nearer to him (could have been “her” but we never got close enough to tell) and finally he shrugged off his layer of mucky shavings and straw and trotted off. But he was back by nightfall and in place the next morning, and the next. He wheezed and coughed a bit one day and we wondered about swine flu and if he could pass anything infectious on to the horses, but he was well enough to crash through the garden fence one day – and crash back out again when he saw us. 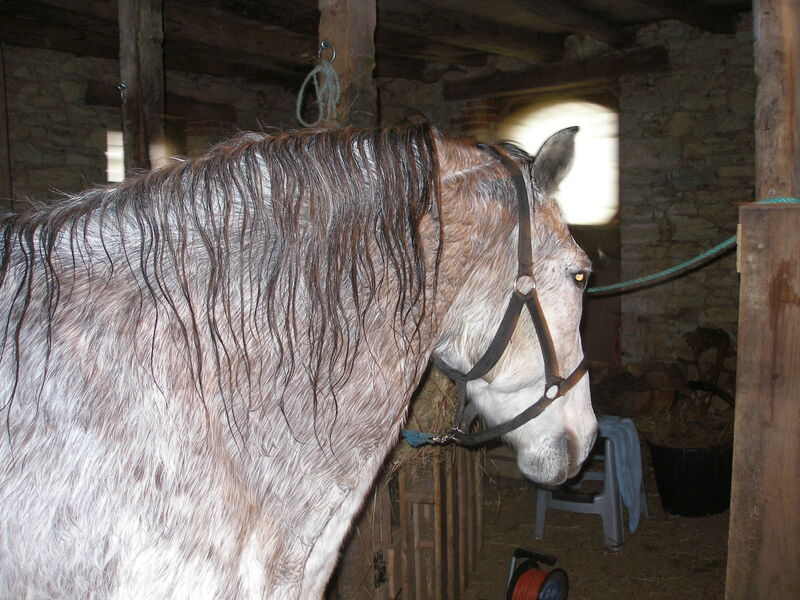 He even took a bath in the horses’ trough one day. He seemed to be making himself thoroughly “at home”. We worried about what to do. The horses remained on edge. The cats were wearing themselves out in brave attempts, to which the piglet was completely oblivious, to defend their territory. We didn’t want to have serious garden damage to deal with. We wanted him to move on and hopefully team up with his kin. And yet we didn’t want any intervention from the hunters, whose only interest in the animals is if they are of the legal size to shoot. Also we were in serious danger of getting sentimentally attached to “Stig the Pig”, who seemed endearingly keen to stick around. 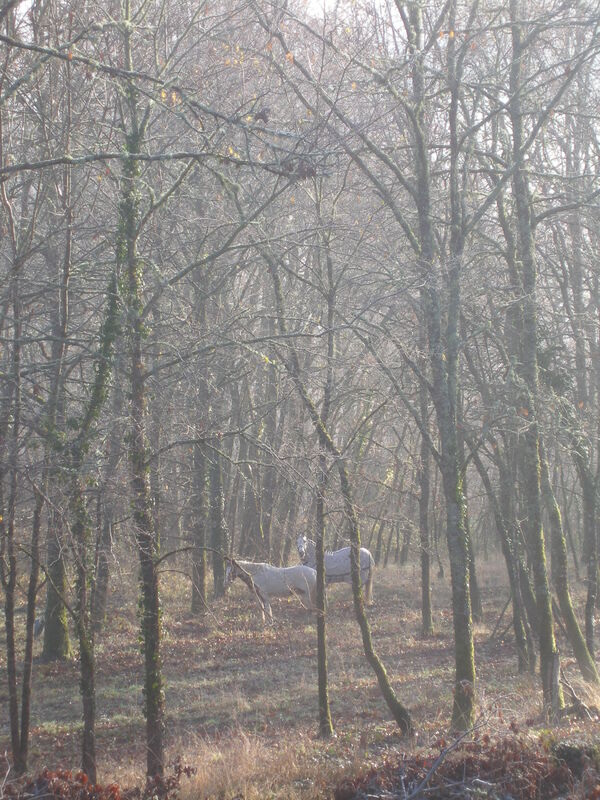 (The hunters locally crossed wild boar with domestic pigs and so these animals produce several instead of only one litter per year and are not entirely wild – I passed the breeding enclosures on rides in the woods years ago.) However you can’t become attached to a wild animal that will grow to half a ton of aggressive boar and, as we live surrounded by woodland, only a small part of which is ours, aggressive hunters (“chasseurs”) are an equally formidable hazard. We went to bed early on New Year’s Eve and didn’t sleep well. Options for a happy ending, however far-fetched, seemed few. I sent up a fervent prayer to whatever elemental force, greater than us piffling humans, might pick up one cry among the deafening white noise of universal pleas. And as we opened the barn doors on January 1st 2018 we found our guest had left. There hadn’t, and still hasn’t been any “chasse” activity in our area recently, so we don’t know why he moved on, and of course, he was never “our problem” to solve. But I hope he survives. As Christmas visitors go, we have had worse! It’s all Anna Blake’s fault, this post and so much more ……. There’s no blogger or horse author I know of who has published such consistently insightful, readable writing on the equine/human relationship. I blame her for making me and horsemen and women everywhere put their horses first. 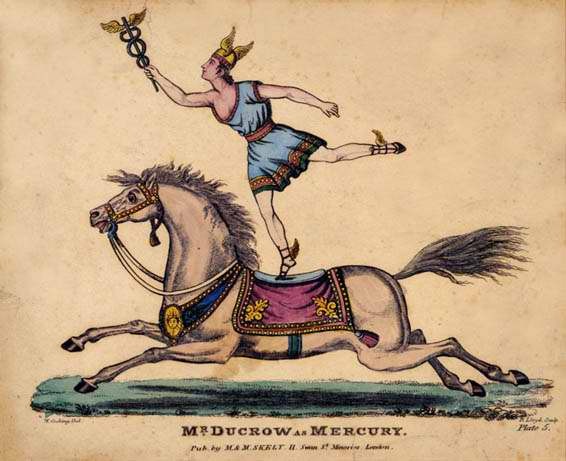 For delving deeper into the horse’s mind than a forensic scientist with a very sharp scalpel and revealing exactly why aspects of of our time-honoured practices and horseman’s wisdom are counterproductive. For shaming us into thinking about the suffering humans inflict on horses, even unintentionally. And she knows how to do it with a lightness of touch and a sense of rightness that mirror the horsemanship she advocates. Enough of the fan mail. Except to praise the loyalty Anna shows to her blogging community: she never leaves a comment unanswered and is always encouraging. I commented rather lengthily on her last post, which led to a brief exchange about amateur horsepeople like me needing ready, willing and able back up in the face of illness or injury. This arose from a heartfelt admission of my own precarious situation. If you were a reader of this blog before I decided to give it a break in January 2015, you may remember that my health had frequently impacted on my equine plans. Well, I say impacted ….. more like ground them into the dust and spat on them. 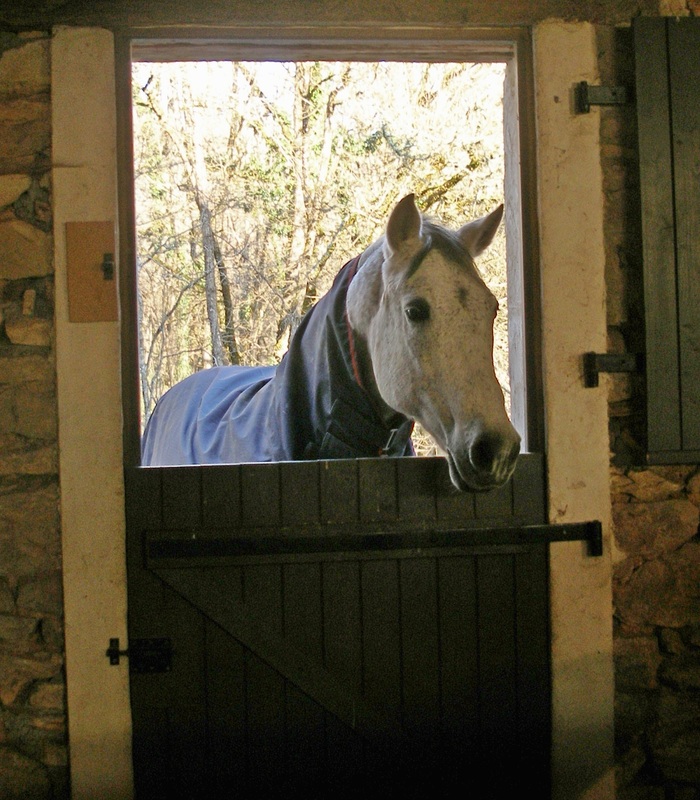 Having bought a new horse to live alongside our two retirees in late 2009, I broke a leg – the only horse-related accident – then fractured my jaw and skull, had another leg op., a period of loss of balance, a broken foot, arthritis in my shoulder and knees, worsening osteoporosis….. the litany goes on. So there was never enough riding time to make the progress I’d hoped for. 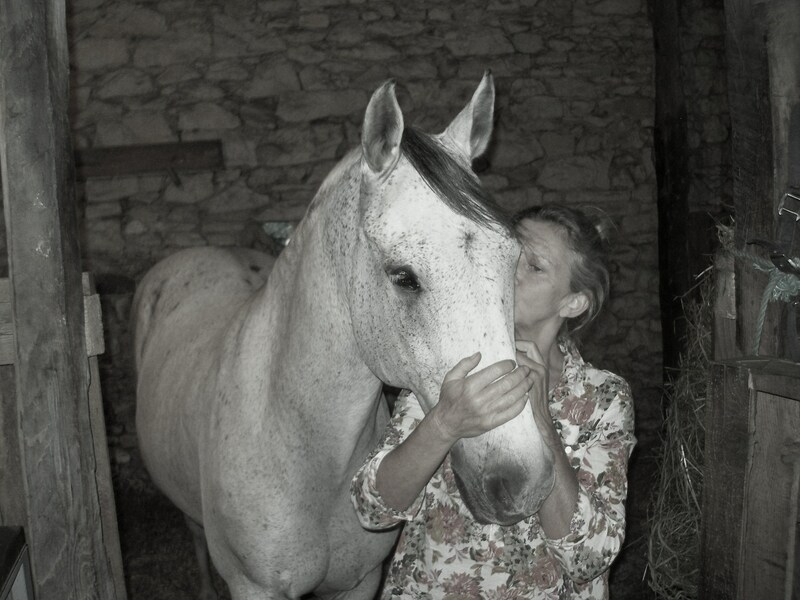 However, time on the ground absolutely transformed my relationship with my younger horse, who initially threw more challenges at me than I thought I could handle but, as time went by, responded eagerly to every learning curve I lobbed back. Now sweet sixteen, Pom, the one-time Spanish delinquent, became the horse I always wanted. And just when, last Autumn, we were getting back into fitness after the heat of summer, I was walking up a small bank and turned at an awkward angle to see if the horses were going to follow me out to the field, when I heard an almighty crack and my left leg crumbled from under me. Luckily the horses were still in the barn. I won’t bore you with the detail (at least not in this post! ), but what a sense of déjà vu! Four months later I am still using crutches and Pom has learned how to pick them up if I drop them. Anna said she’d like to see it, so please bear with me as I’ve not posted a video before, in particular the sound is a bit loud in the first and the second two are rather murky! “It’s a little known fact that we horses are great believers in New Year Resolutions. Or at least Reflections. Let’s face it. We can realistically expect to celebrate far fewer New Years than you, our human counterparts. So instead of going out partying or going to bed early pretending you don’t care, if you humans were to peek into the barn or the field shelter around midnight, you might find your horse and his or her companions mulling over the year past and thinking about what to make of the year ahead. In smarter establishments than mine, elite athletes may be bragging about the cups they bagged in 2014 and the prizes they have in sight for upcoming seasons. 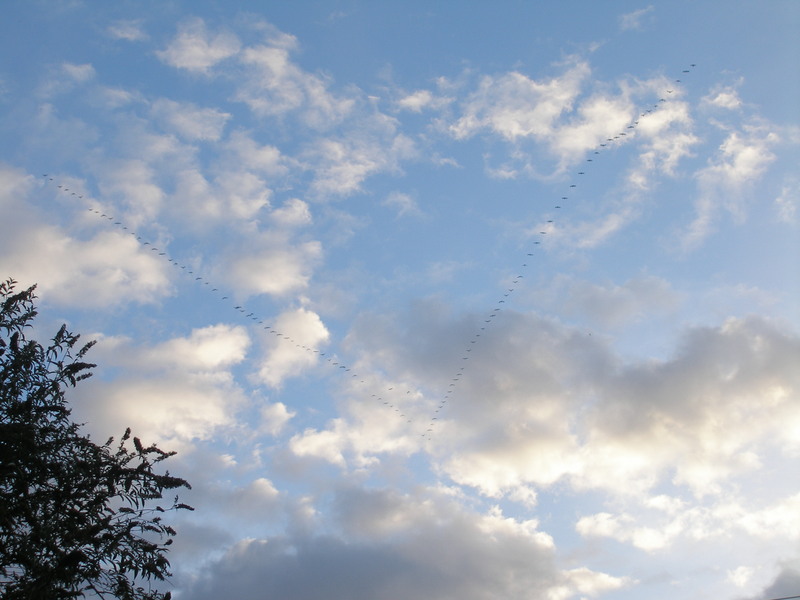 Some may be yawning – having heard it all before – quietly hoping their sore backs and tendons hold up another year. Others may be apprehensive about a move away from all that’s familiar or how they’ll fare with a new owner. Some may be counting their lucky stars that fate delivered them from an unhappy situation and renewed their faith in the future. At the other end of the scale some poor souls may be shivering for want of a good feed or blanket and worrying about how they’ll be able to help their humans through another year. The vast, lucky majority of us will be glad of full tummies and comfortable billets. We are truly grateful to be better cared for than a good many members of the human race. And if that means we can’t get to gallop over prairies at will or run the gamut of equine emotions within a large herd, we do understand that all living beings have dreams, but have to learn to compromise with workaday realities. We’ve had varied years in which we have all had new experiences; mostly pleasant, some disconcerting, nearly all enlightening. Despite our darkest fears, we were, again, secretly disappointed not to be chased by mountain lions. We were often told that we were the handsomest, cleverest, good-boys and girls. We occasionally had to suffer unnecessary swearing and blame for things of which we were completely innocent. Of course we would not intentionally mucky our water buckets or make unscheduled halts in front of malodorous swamps. We who have good humans have been the recipients of an awful lot of human love; gooey, sticky sentiment and inappropriate hugs and kisses. But that’s a small price to pay if there are also carrots, occasional home-baked treats, well-kept pastures, sweet hay and cool, clear water. We would love to reassure our humans that we can put up with some mistakes in their riding if what they want is explained as clearly as they can. Sometimes we wish they would listen when we’re trying to show them there’s a better or easier way. And sometimes we just have to say, as emphatically as we are able, that we really can’t understand or physically achieve what they want, or that their riding ambitions are beyond our abilities. We would also like to reassure them that we understand more about their troubles than they think. We’ve heard those thoughts rattling round in their brains when we could be having a relaxing hack or a productive schooling session. We know about the bitchy boss, the dreaded exams, the husband’s complaints or the kids’ taking Mum for granted. We try to be helpful and sympathetic, where we are able. We’d like them to know that although they are weird-looking because they’re humans, each of us thinks their own good human is the best-looking, most outrageously attractive one they know, even if we would appreciate carrying a few less of their pounds just after Christmas. When we think about the year ahead, we generally long for safety and security, kindness, good food and company, freedom from pain and anxiety for all our kind. And for our humans, freedom from the worries that kill kindness and sour their relationships with us – and each other. Of course we can’t really give you bipeds an inkling of our hopes and worries. We know you think we exist in the present moment …… but we certainly have more instinct about the future, even if we have less power over steering our own courses than you do. 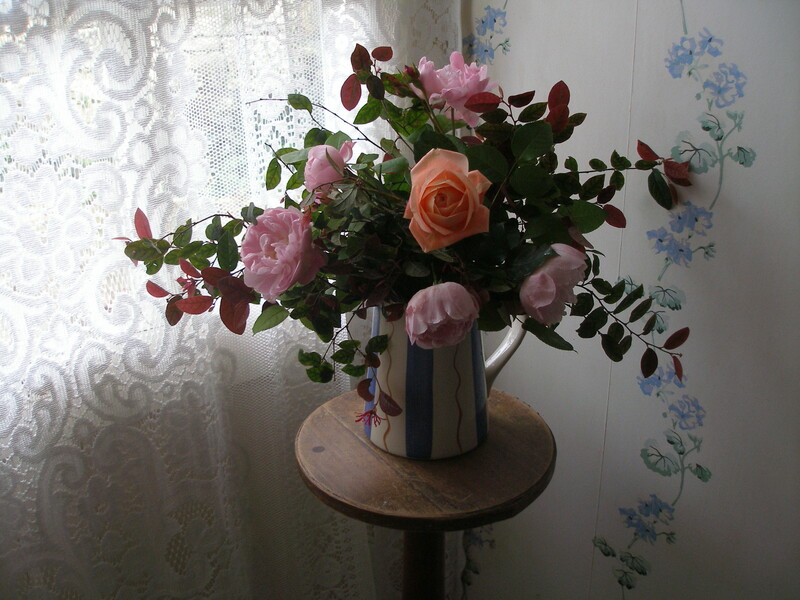 This weekend I picked roses in the garden, which still held a subtle perfume of summer …. Then, the next morning winter arrived, just in time for Christmas. 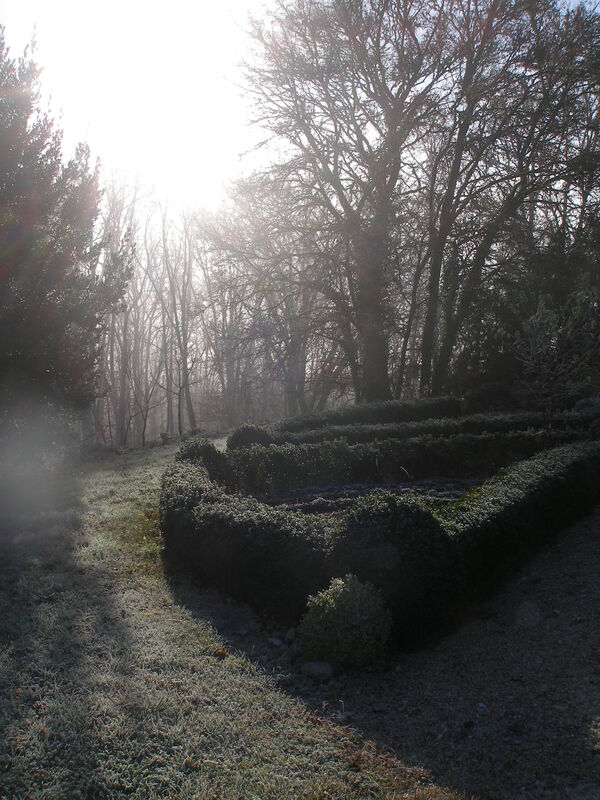 Whatever you believe, wherever you are this Christmas, I wish you the perfume of old roses and the crackle of a frosty morning, the warmth of the wood burning fire that’s in front of me and those you love within arm’s, or thought’s reach. In my last-but-one post I wrote about the gargantuan task of clearing out the top of the barn and laying a new floor over the old one. 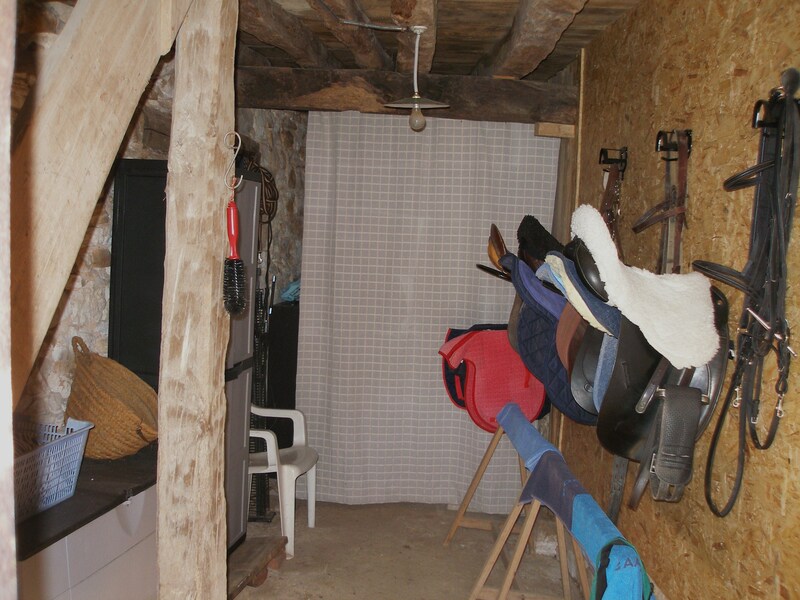 And I’m glad to report the job is finished, the junk has been cleared, the stairwell down to the stables has been boxed in (and the stairs repaired) and the horses now have a much tidier, dust-free environment. The knock-on bonus for me is that a grotty, dark, cubby-hole under the stairwell, where we used to stash all the gardening tools and equipment (do plastic plant-pots multiply if left on their own in the dark?) has become my first-ever, dedicated tack room. Instead of bits and bobs tucked away in cupboards and boxes all over the place and never to hand when you need them, I now have a neat, clean space where everything has its place. And, oh, how very satisfying that is. (Some of the gardening kit remains behind the curtain, but it has been dusted and put on shelves, promise). In a world where the Four Horsemen of the Apocalypse seem to be riding ever closer each time you can bear to be beaten over the head by the news reports, sometimes the only way to keep sane is to organise and feel in control your own little corner of the planet. There must be a psychological term for it. Cocooning? OCD? Any suggestions…? 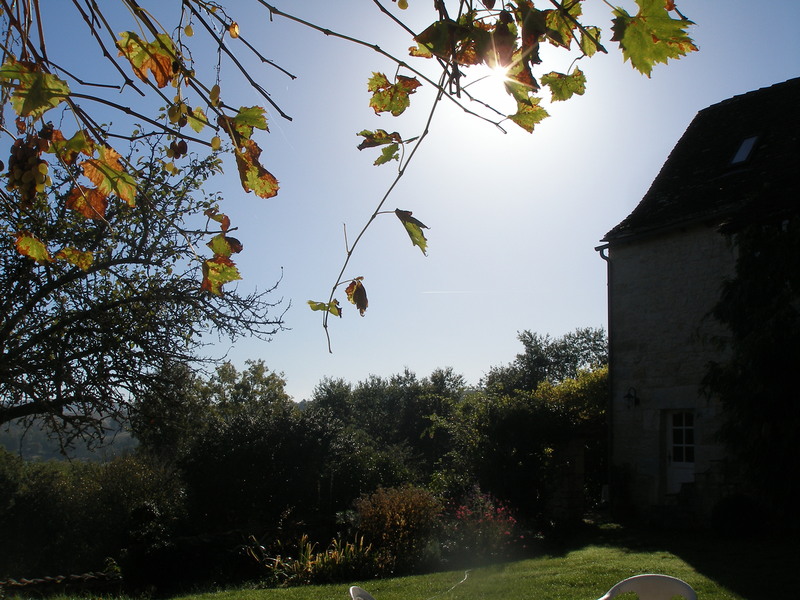 And as the weather cools and the sunshine sparkles as it did around 10 this morning – the clocks having gone back last night – we are getting into the right frame of mind to make the most of the cooler season. The Pie, at 28, is under strict surveillance for signs of ageing that we can relieve in any way. As his main problem is a touch of arthritis in his hips and shoulders, he is presently undertaking the Cucurma Challenge. Having followed discussions on various forums and read scientific data, we decided to go with a gradually increasing tea to coffee-spoonful of turmeric, with a few twists of freshly ground black pepper and a good glug of omega-rich oil mixed into his usual ration of pelleted grain with apples and carrots (and figs – we have also just come to the end of fig season to the great regret of the horses). So far, after about a month, his mobility is good, but not miraculously improved, however the most noticeable side-effect is ….. you can guess …. Of course, Mr. Matinee Idol had to get his picture taken too once he spotted the camera. So this is a time of farewells. The tourists and the flies (no relation) have largely disappeared with the excessive heat – yay! Ice-cream is out (but chocolate is in) treat-wise. Sandals, shorts, suntan cream (yuck) are thankfully back in the cupboard, and the garden furniture is being put away. 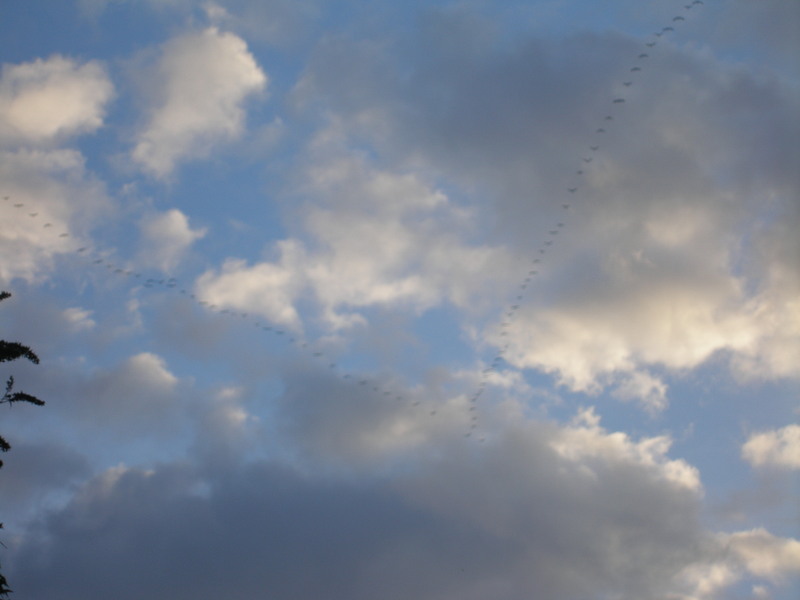 And when these guys fly over, crying “grue, grue” (which is French for crane – both the avian and construction varieties) and my birthday is just around the corner, we know it’s time to buckle down to winter with a relieved sigh. 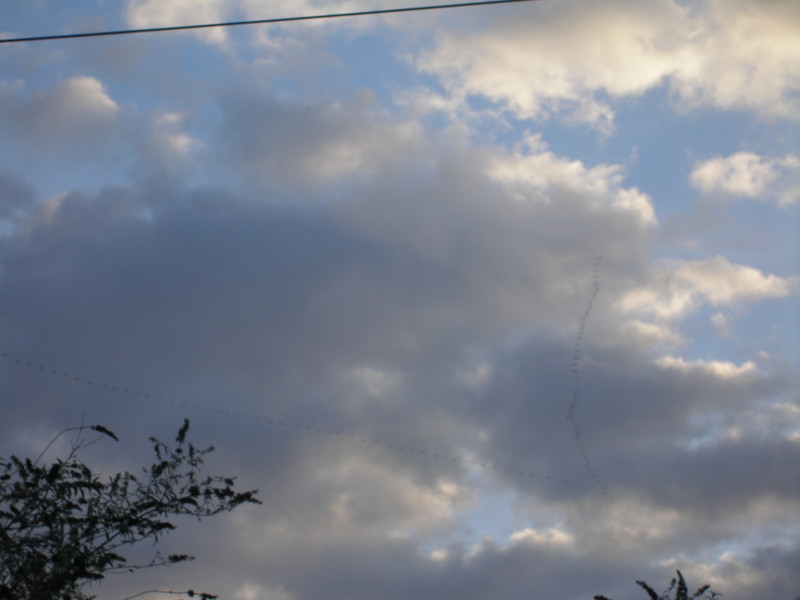 Just about ….. gone. Au revoir! My husband complains that there are four of us in this marriage, and that he is usually last in line for my attention. He’s not at all impressed when I put forward the argument that the British cavalry became the envy of the world because they always put their horses’ welfare first. Thank goodness horses no longer have any place on a battlefield, nor can I make the leap of imagination between keeping horses for pleasure and honing an implement of warfare. But our horses, as domesticated animals, have no more control over their lives and destinies than soldiers of a bygone age and their hard-pressed mounts. We own them from the tips of their velvet ears to the soles of their swift-tipped hooves: we owe it to them to take care of them to the best of our means. 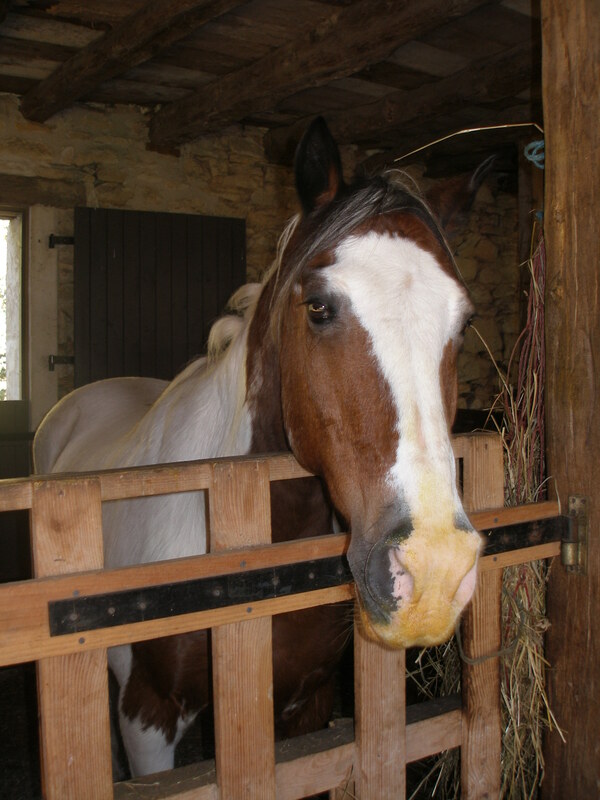 So, in my book, the horses’ needs come first, be it feed, water, medical attention, shelter or security. If my husband feels a little peevish occasionally, I know that, really, he is a secure enough adult to provide for his own needs and be sure of his place in my heart. Originally I entitled this post, “Just How Much Should You Love Your Horse?” but the answer to that seemed a no-brainer. If he or she doesn’t occupy a decent sized chunk of your heart you should check you still have a pulse. However ….. loving your horse in a Mummy’s lickle baby, matching pink accessories, sugar lumps on tap, kind of way is not going to do anything for either his or your self-respect. And if you’re that kind of girl, you don’t need a horse; get a designer dog in a designer handbag (preferably a soft-toy kind of dog). 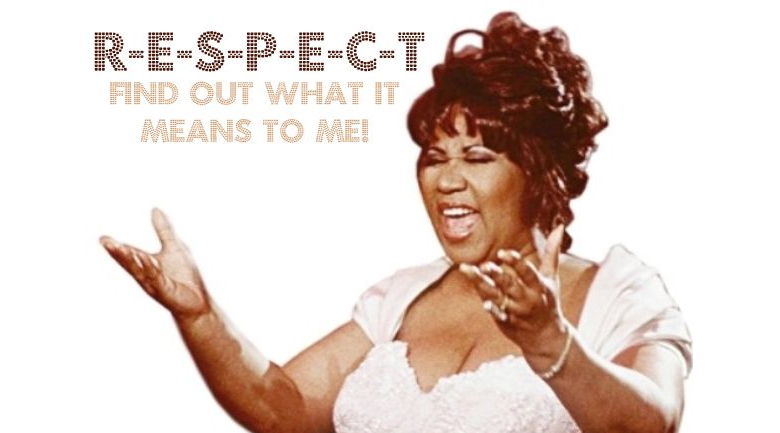 So where does Aretha come into it? When I was having my initial difficulties with Pom, friends were quick to say I was “too soft” and he should be taught Respect. At the time I was too busy teaching him to trust and not to eat me. To me Respect doesn’t work unless it’s mutual. It doesn’t mean that you lay down the law and your horse jumps to attention the minute you apply hand or heel. It means that you both respect the same set of rules, so that you’re rowing in the same direction up this difficult river of partnership and at the same time you respect each others’ differences. R: Reassurance (Mutual). As partners you are there to support and reassure each other, sing off the same hymnsheet, work toward the same end, trust each other. If he scares the living daylights out of you once you enter his box, or she cowers before your authoritarian diktats, you are not a marriage made in heaven. E: Empathy. You don’t have to fall into exaggerated anthropomorphism to know that as highly evolved mammals, horses have most of the same needs and basic emotions as humankind. Shelter, food, company, security, health, freedom of expression… The conditions you provide affect his wellbeing profoundly. S: Space. Both of you will have areas of personal space you want to call your own. You don’t want to be head-butted in the face because you quite like your nose to be centrally situated. He might detest your urge to touch his ears when he’s eating. Both of you have a right not to be hurt or annoyed by the other. P : Preferences. You might not like high speed travel. He might not like the sudden appearance of men in flourescent lycra on racing bikes. You have your natural human fears. His are no less valid. E: Empathy. I know I already mentioned it. It’s probably the most important point. Think how you would feel in his place. C: Character. His easy-going nature might calm your nerves or her highly strung reactions might need your steadying hand on her mane. Your natures may be complementary or contrasting, but you need to find a workable harmony. If, after giving the partnership every chance of taking root you have to admit he’s a country boy who prefers the wide open spaces and he’s never going to realise your dressage dreams, find him a happy home elsewhere. T: Tact. You want his prowess to look effortless. He wants your aids to be as light as possible. Tact comes out of mutual understanding and empathy. Politeness isn’t just a social nicety, it oils the wheels of conversation in many guises. I’m sure all of this comes naturally to you. In an ideal world respect and love should go hand in hand. Sometimes it takes a sense of humour to remind us. Nearly thirty years’ worth of old furniture, boxes of books and clothes, tea chests full of glasses and crockery I hadn’t seen since we moved from London, rugs, building materials, ladders, scaffolding, gates, seven pairs of French windows (don’t ask), off-cuts, left-overs, might-come-in-handies, ancient stuff left by the previous owners that might have “historic” (certainly not material!) value, even other people’s larger, cumbersome belongings we offered to store for them ….. we’ve had to dust off, sort through and steel ourselves to part with as much as possible. Of course it should have been done years ago, but, as you all know; unless you’re an iron-willed minimalist, “stuff” tends to aggregate according to the space available for storage. 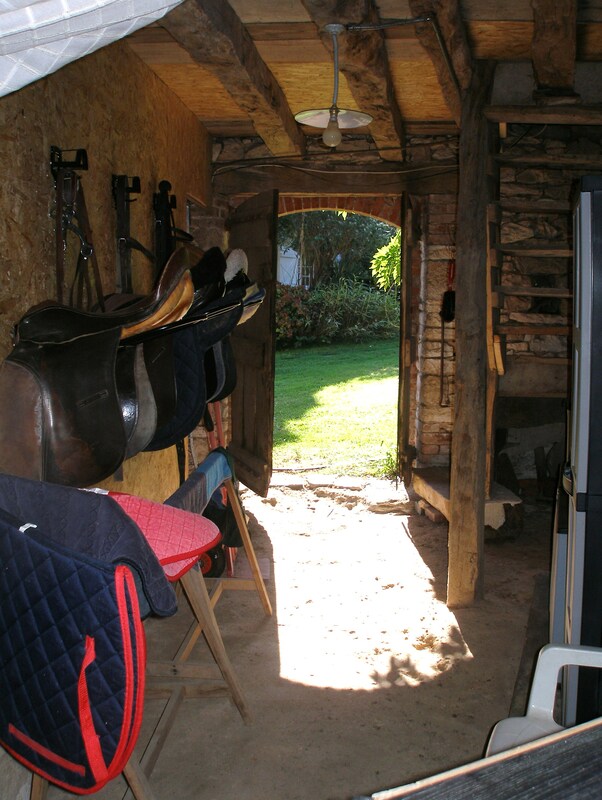 And we are lucky enough to have a lovely, big barn with space for the horses’ loose boxes, firewood storage, and workshop downstairs. Upstairs is one vast beautiful space, with stunning timber work, where we keep the horses’ hay, the tractor … and just about everything else. 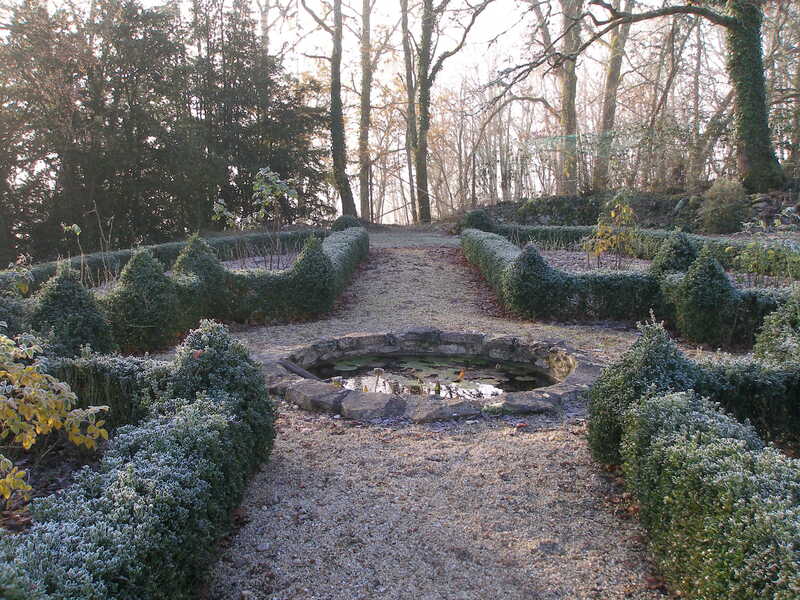 To back-track through the ages – and forgive me if you’ve read about this before – in the mid 1980s we bought a dilapidated house to restore and with it were outbuildings, ruins and land that came as an unexpected plus. 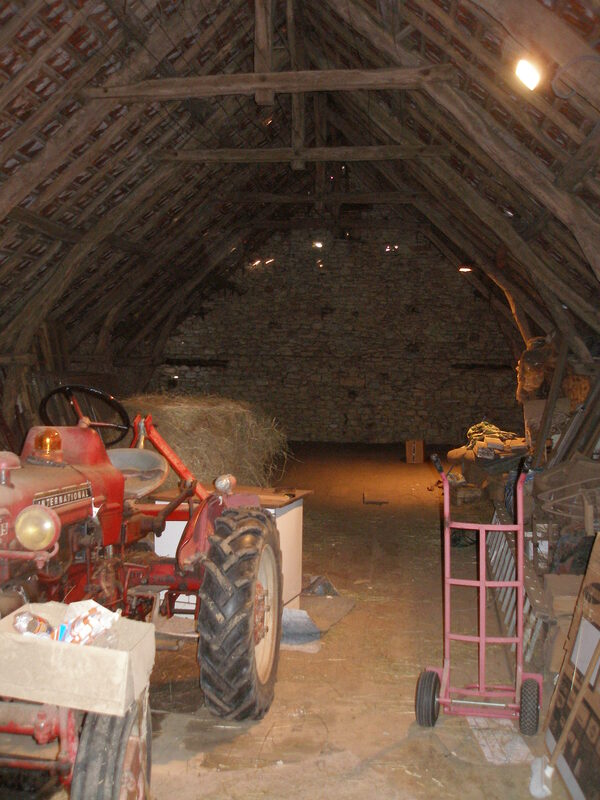 The big barn, which had been rebuilt at the turn of the twentieth century was in the best shape of all, so we were able to pretty much ignore it and keep filling it up with our worldly goods, whilst we got on with restoring everything else. 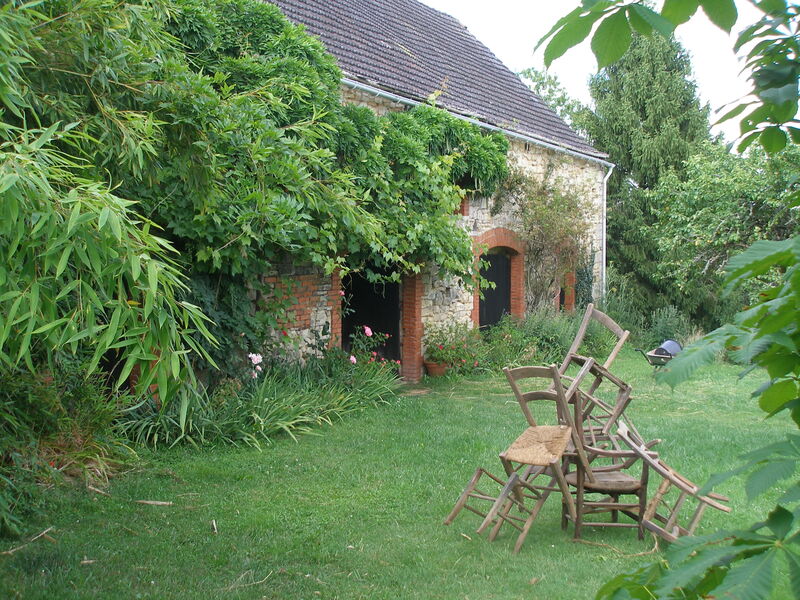 At the beginning, people used to visit us and say, “Lovely barn … shame about the house”. 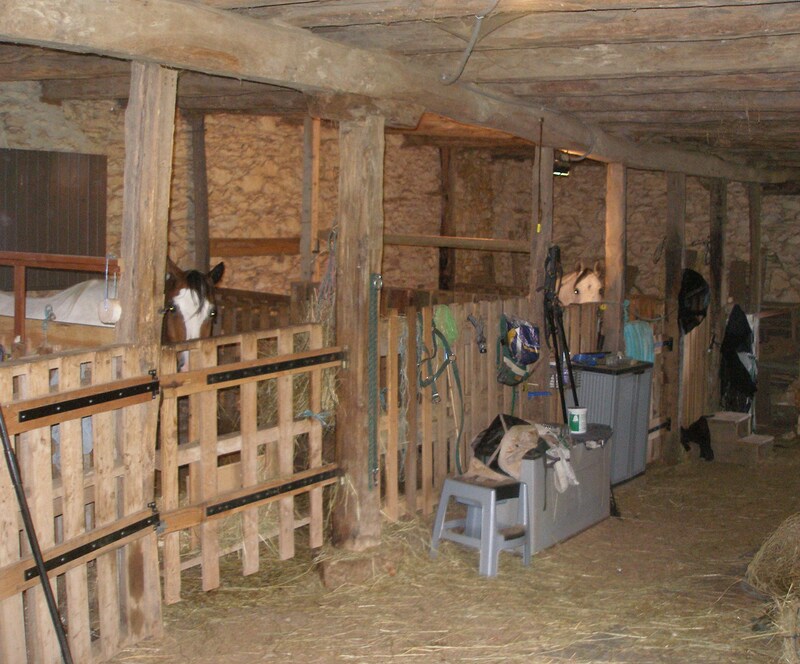 The barn was full of hay which must have been more than twenty years old and still smelled sweet. Nutrient value nil. But we knew the hayloft was well aerated (it had a network of overhead wires that meant tobacco must have been dried in there) the structure and roof were sound. And we abused it by filling it full of our junk. And it’s true what they say. You never quite finish restoring an old house. So you hang on to everything; Just In Case. The tipping point was the dust. We used to get a winter’s hay delivery from our neighbouring farm and sweep out the dust and leavings as the horses transferred to grass. Now they come in every night of the year and we collect the hay, bale by bale, from the farm up the lane, so the loft is never empty of an open bale. And the dust has drifted, thick as Christmas snow, on everything stored up in the hayloft and it dribbles through the gaps in the old floorboards, down into the horses’ boxes and everything we’re trying to keep clean down below. After much debate, we found the cheapest solution is to lay down a new, chipboard floor over the old, sound-but-gappy planks. It’s chosen, paid for, and awaiting delivery from a friend’s sawmill, before France goes on holiday for the whole of August. And what is great is that, since I last posted, we have a helper, one afternoon a week, who’s a hard worker and a joy to have around and who is making a great difference to whittling the “to do” list down to manageable. So, instead of forever chasing my tail to catch up with myself, I’ve been able to keep up a regular riding programme with Pom. Getting down to the school before the sun scrapes over the trees, before the heat and horseflies kick in, and making up for all the time we’ve lost for one reason or another. We’ve had such fun. And we’ve learned a lot about each other and where we are after four frustrating, hit-and-miss years together. So, as we wait for the new flooring to be delivered, Eric and Rob have been ferrying old bits of pool liner, extinct bikes, decrepit garden furniture, bits of plasterboard, dead tools (and plenty of other things they probably judged it better not to tell me about) to the recycling plant. Whilst my back was turned an abstract installation of crappy old caned chairs whose bottoms had fallen through appeared in the courtyard, to wind me up. Back in the day I’d restored and re-caned a dozen; these had been kept for “spare parts”! And I’ve made a start on deconstructing the cardboard boxes and packing cases. It could take a while. First up was the box containing some of my childhood books and mementos. I didn’t realise quite how early the horse obsession had set in, but pony books were among my very first reading aids. Here’s a little spread of what I found. I’ve already admitted to reaching a ripe old age in a recent post but looking at the books I’ve saved – possibly verging on antiquity – I got all overtaken by nostalgia. “Watch the Pony Grow” (top left) just about finished me off. I was probably too small to turn the pages myself when I acquired this. Most of the books have birthday inscriptions, so friends and relatives had me down as horsey from the get-go. And what a gift to present-givers to know the recipient has an obsession they can readily cater to. I’m going to luxuriate in delving back into those pages and reliving a well-spent youth. 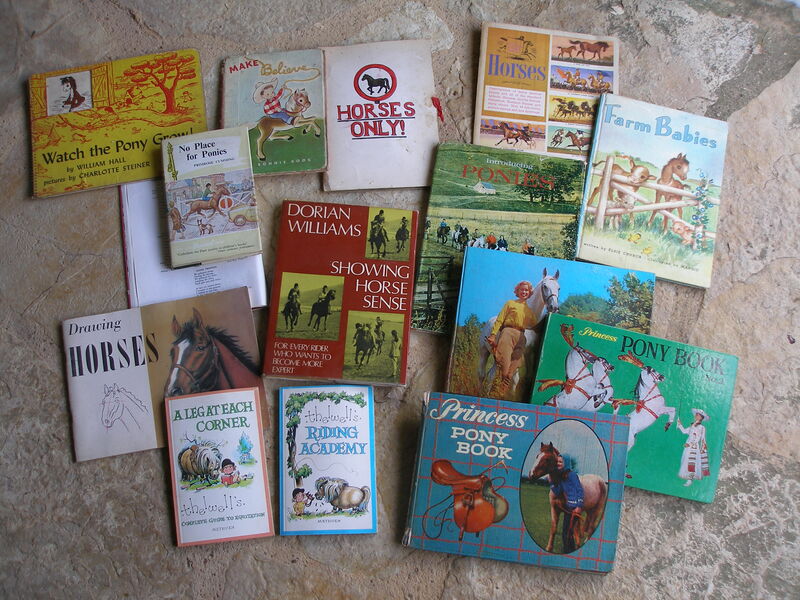 Does anyone else remember Princess Pony Annuals, Thelwell and the Jill Books? What did you read that inspired your riding? I’d love to hear ….. 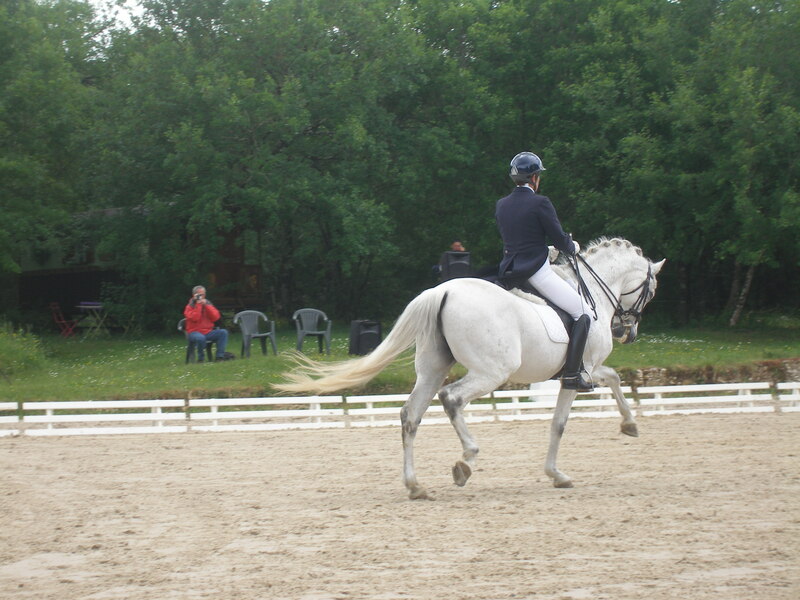 I had the pleasure of watching a dressage competition, not too far from here, last weekend. In only its second year, word had obviously spread that the previous year’s organisation and welcome had been a success. And this year, alongside FFE dressage classes (French Equestrian Federation), there were events under the aegis of the Masters du Cheval Iberique, who organise similar classes and leagues but are open only to registered Spanish and Portuguese horses. They have slight modifications in the tests and give extra points to competitors who compete in traditional Iberian dress/tack. Though sadly my photos didn’t come out, there were two riders in Spanish dress, one of whose sombreros blew off twice in the wind (the gusty wind spooked a few of the horses). A Mrs. Italian Sparkly Boots, of a “certain” age, did a very creditable freestyle to music which she and horse were pleased about, and there were a few others including a super-competent Miss Embonpoint whose horse shied and reared at one gusty moment, but recovered and went on to prove a star. A very elegant rider on a huge KWPN mare had a little girl run right out in front of her as she was coming round the outside about to begin her reprise, which put her horse on edge, but she managed it beautifully. (Little girl and her blasé parents were very lucky she wasn’t mincemeat.) 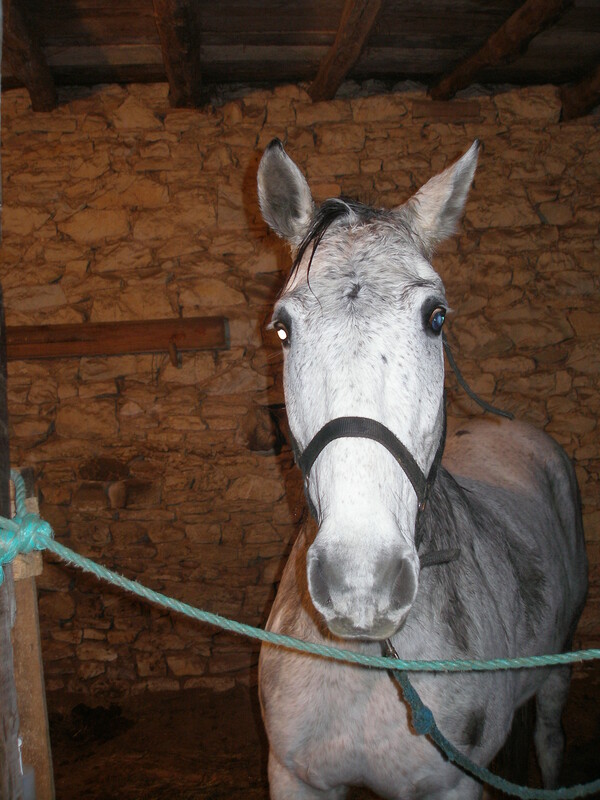 I spoke to the rider after and she had come over from Bordeaux and competes all over south-west France. 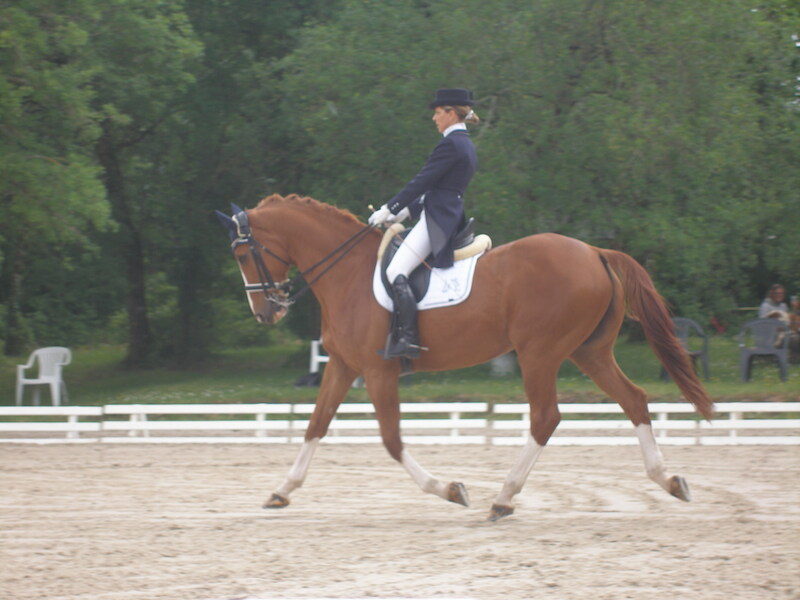 Not having been to many dressage shows – in person – ever – I was in horsey heaven. Wonderful horses; from the riding schools (“Poney Clubs” in France) who imported a small contingent of their best horses and young riders, to very sophisticated rider/horse combos used to competing at a regional, even national level. There was an astonishing array of horses and riders to observe and scrutinise throughout the two days. I went with a friend on the first day and just had to go back for more on the second …. I didn’t agree with everything I saw, but it was all a good learning experience. I was hoping to find that there was a niche I could aim for at the lower level. And, yes, I was inspired. Will we enter next year? … Mmm… it’s certainly a challenge …. 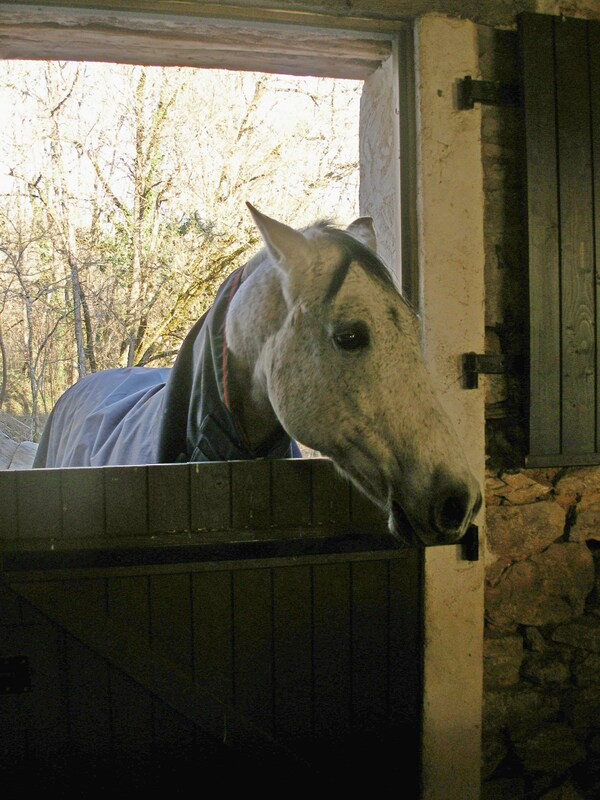 A non- horsey subject: do you value good service – and are you a generous tipper? Have you ever worked in a service industry? I wouldn’t pretend to be an extrovert, but I’ve waitressed, air-hostessed, welcomed customers in various circumstances and it is easy to recognise people who are big enough to appreciate good (or your best effort at good) service. They are well-mannered, polite, smiling and reasonable. And, in the relevant circumstances, they leave an appreciative tip. Occasionally I meet up with my girl-friends for lunch. We refer to ourselves ironically as “the ladies who lunch /the coven/the lunch club”, because we all work hard and it’s unusual, rare even, that we have the time to meet. If I ever get a glimmer of individuality through the professional attitude from whoever’s waiting my table, I will make it my mission to engage with them and make their day a little more interesting if I’m able, and if they’re up for it. And, unless our meal has been appalling, if the service has been good, I’ll tip at least 10%. If I’ve enjoyed the meal, I want to be welcomed back. But my lunching friends are not always of the same opinion. Have you a view on tipping? 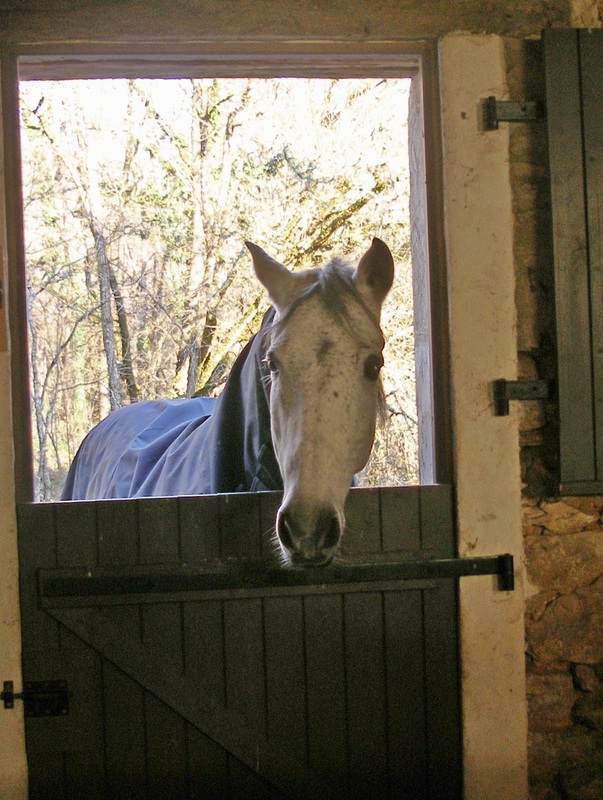 A few nights ago, we went out to do our “last thing” check, provide the night’s haynets and skip out of the horses and, oh no, couldn’t see the Pie looking over his door. Was he alright? Was he prone on the floor? Then we saw his head poking over the back gate of Pom’s box. 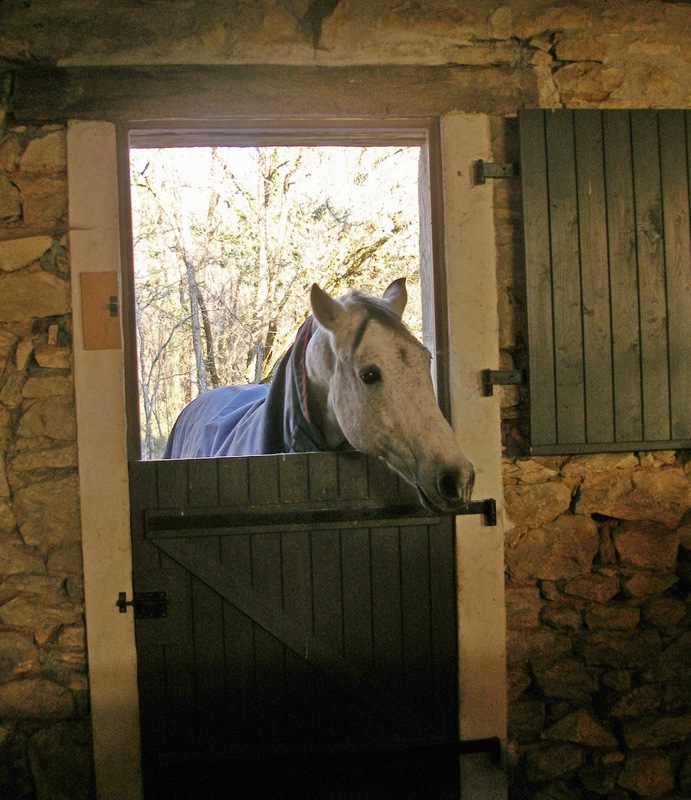 There is only one back door in the barn and Pom has to come in through Pie’s stable, pass into his box on the left, then, in principle, the heavy interconnecting door is bolted behind him. Either bad Mum left the bolt undone or Pom opened it whilst scratching his behind on the door (it has happened before, but the former is more likely). Pie, trying his luck, must have pushed through, though the door is heavy and swings shut automatically. How long they had both been in there together I don’t know – the floor was fairly stirred up, but apart from a small bite on the Pie’s neck, there doesn’t seem to have been any worse handbagging. A second bolt has since been added! May has been glorious here. The garden has been a symphony of colour and perfume thanks to a mild winter and rainy start to the year. Sadly my husband slipped on the stairs and broke his collarbone and one or more ribs. Sigh. He’s not a patient patient. I have finally persuaded him that we need some help in the garden and today we met a gardener proposing his services for the heavier garden jobs. A new chapter opens. Great news for me as I’ve been keeping up a regular schooling programme and would rather be concentrating on riding Pom, while he’s still in his prime, than teetering on a ladder tackling the huge box hedge or hauling wood… I really hope this works out well. Cross fingers for us. Recently we went to dinner with a great friend to meet the new man in her life. Her three children helped to make the meal and the conversation round the table was lively and easygoing. The talk turned to Finn’s school skiing trip and I said I’d always meant to try skiing, but somehow never got around to it – despite the fact that we’re only a couple of hours’ drive from the Pyrenees. Embarrassed pause – then laughter all round. You really don’t give it too much thought, or as little as you can manage, as you putter through your fifties (Hell, it takes you long enough to get over the shock of Being Fifty) but once you turn 59, you cannot get, “Yikes, I’m nearly 60!” out of your mind. Now riders will often tell you that equestrianism in its many forms is one sport in which you can continue virtually as long as you are sentient, citing Lorna Johnstone and Hiroshi Hoketsu, dressage Olympians at 69 and 71, not to mention a slew of eventers and showjumpers in their fifties’ prime as doughty, though exceptional, examples. Naturally, you need to have a decent level of fitness to handle and ride horses and all the exercise involved in looking after and riding them helps keep you that way – a virtuous circle if you’re lucky and doing it right. But not even the fittest rider can count on their continuing good health, despite their best efforts. 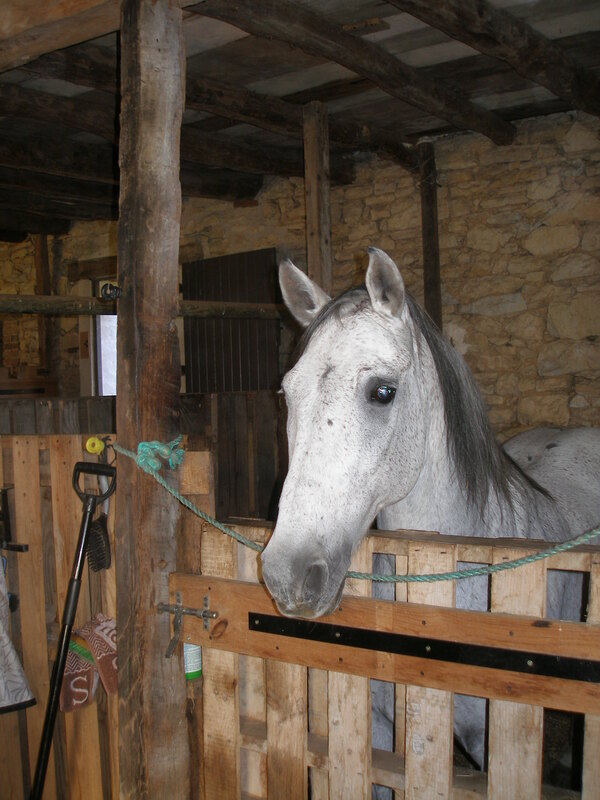 When I began this blog, I was in my mid-50s and optimistic enough about my health and fitness to have recently bought a new horse. 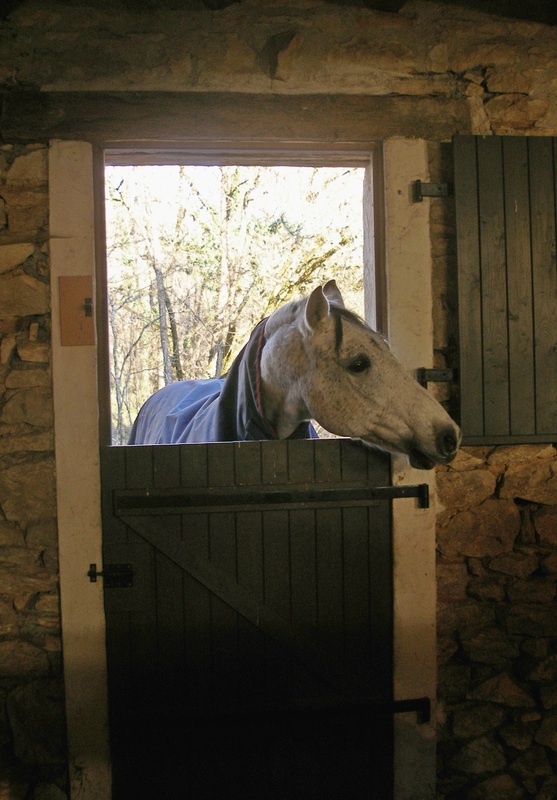 We still had two horses living a pleasant retirement at home, but I found that my life had a large, active-horse-shaped hole in the middle without riding. 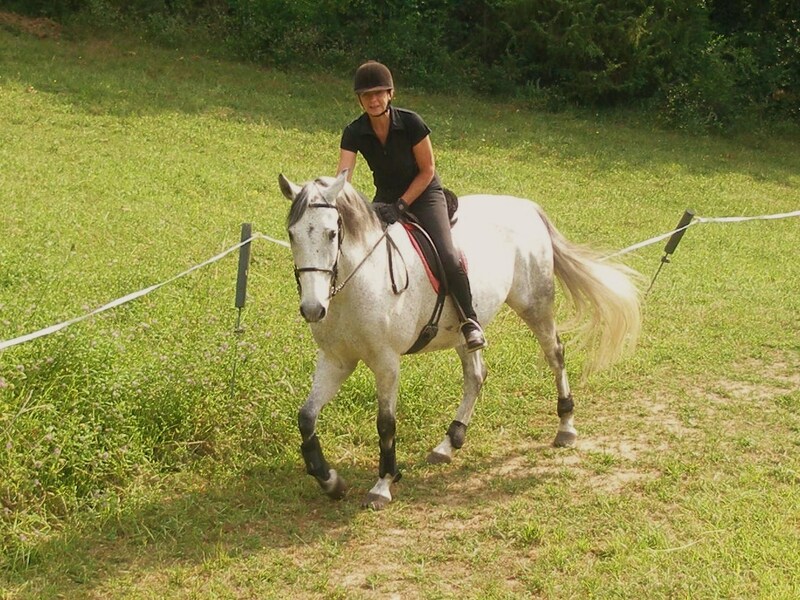 Even exercising a friend’s Lusitano just wasn’t the same as having the intense one-to-one relationship of riding your own horse. I’ve written at length about breaking my leg, then fracturing my jaw and skull, so if anyone new to the blog really wants to know more about this era, the posts back in 2011-12 will fill you in, otherwise I won’t dwell on events other than to say that it takes a long time to get back in shape once you’re over fifty and at the stage of life where you need to pay attention to your thinning bones, lack of energy and unpredictable moods. Once you’ve lost your levels of health and fitness at this age they are harder to regain and maintain, especially mentally. In other words, instead of moaning and resigning yourself to getting older, you have to make a determined effort to manage yourself with much more forethought and really Think about how, when, where and why you ride. And generally live your life. With hindsight, this is all more clear-cut when you’re young and fit. Your time, family and financial commitments are much clearer, whether you’re a cash-strapped student, a Mum or Dad with a job or a single, career high-flyer. If you have no health or fitness problems and if your time and financial constraints allow, you take your ability to ride for granted. Being suddenly prevented from doing as you want for physical or mental reasons gives you some insight into how hard it must be to be permanently disabled or at the mercy of debilitating conditions or diseases. Or prevented by any other insurmountable (sic) problem. And just wanting to get back to riding after injury is not, in itself, enough to make it happen. I could have, but very fortunately did not “lose my nerve” and couldn’t wait to get back up there, probably because my injuries were caused in banal circumstances and not as a result of a jumping mishap, or a terrifying bolt or spook (and I’d had plenty enough of those as a very young rider and bounced back). Even so, it was a possibility near the beginning. And the healing of bones was just part of getting better. My whole organism suffered over the next two years; weight loss, hair loss, loss of balance to the point of being unable to walk and a loss of appetite for life itself. I sunk into a slough of depression far deeper than I realised, until I was finally out the other side and, only now, three years after initially splintering my tibia do I finally feel as if I’ve spent some several months of quality time being “well” again, physically and mentally. It’s also a frightening thought that, if I hadn’t been able to keep the horses at home and continue to support them financially, and rely on my husband’s help and goodwill, I might have been forced to give up altogether. I feel so relieved about that. And now I can honestly say that I am feeling better it is all relative, because now I am well into my sixtieth year on this planet, I am forced to acknowledge that can never get back exactly to where I was before. 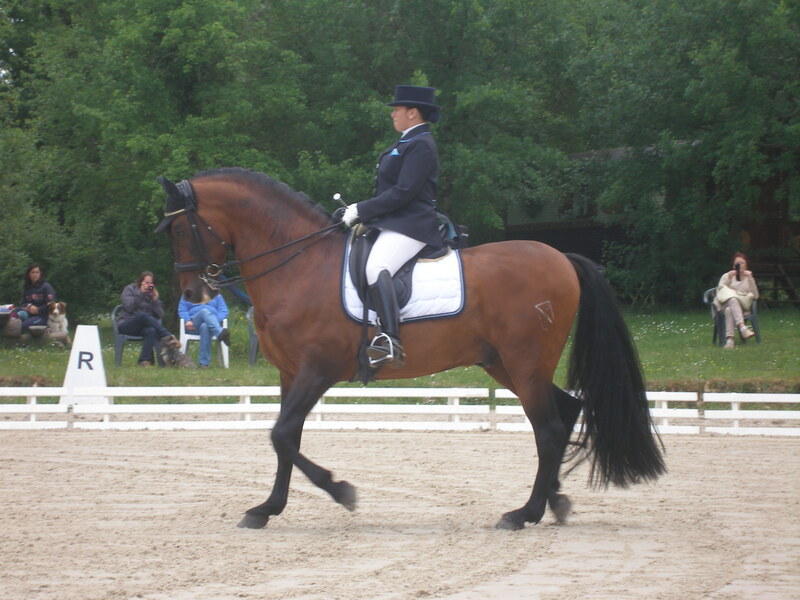 – In periods when I’ve been physically or mentally unable to ride, I’ve been able to read much more equestrian writing, in books and magazines and particularly on-line, that I wish I’d had access to earlier (and been able to put into practice with my last horse, who I always felt had oodles of unexploited potential). I was much more of an instinctive, natural rider, but I awoke to the importance of marrying the physical and the mental, in horse and rider. – I’ve learned the importance of reading and listening to my present horse in minute detail, being forced to do much more groundwork with him than would formerly have been my preference. It’s done us both a world of good. – I’ve finally learned patience because I’ve been forced to go so very slow. 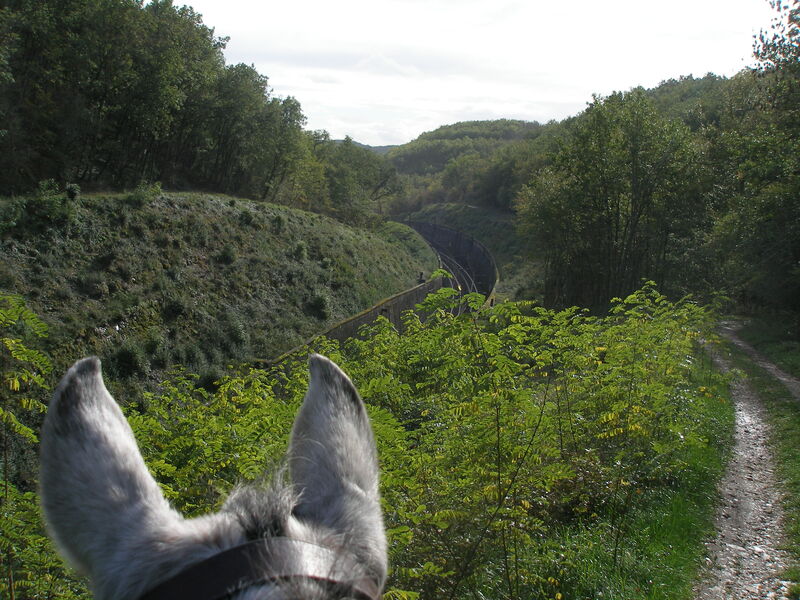 I was thinking today that my horse and I have arrived at a place in our schooling now where we could otherwise have been two years ago – but maybe our mutual understanding would not have been consolidated in the same way. I learned to wait, withdraw, wait and quietly explain until my horse understood what I wanted, which earned lavish praise, until his unwanted, challenging behaviours trickled away. – One of my early posts, “Horse or Garden”, posed my dilemma on a fine-weather day. Now it’s always Horse first. My troubled junior rebel is now a poised teenager – 13, like Finn. He’s attentive, listening, light off the leg and in the hand and improves with every session. The garden can take second place, though it does take a lot of satisfying work and gives me immense pleasure in a different way. – In earlier posts, eg. “January Blues”, I was also searching for riding friends, fed up with being isolated. Well I did find some lovely people to ride with but here’s a thing with some riders; they are so fully committed to improving their horses and riding that they get into the habit with other people and their horses, and not always from a knowledgeable point of view. I know because I’ve done it myself. Yes, I’ll always listen to another point of view, and it’s lovely to have horsey friends to share rides and experiences with, but I have learned to have more belief in myself and my horse (and sometimes keep my opinion to myself as long as no one’s getting hurt). As an aside – the horsey world I’m on the fringes of being relatively small – I ran into an old friend with whom I’d fallen out many years ago and we were able to have a normal, pleasant exchange of views. Which felt like an old mental cloud drifting away. – Clicker training was a great discovery, in part because it validated the reward-based training I prefer, but also because it was a new avenue to explore and made me extend the range of things I could ask my horse, because he devours knowledge like a dervish and needs ever more to swallow up. – I’ve learned to think about the way I work and not ignore the way my body or mind are letting me know they’re feeling, in the same way I would for my horse. I’ll take a break or change in what I’m doing when I need to, before continuing a physical or mental task. Or not be ashamed to take an easier, less taxing way. Moving a muckheap or spring-cleaning the house doesn’t all have to be completed in one go! – Maybe I’m not necessarily a better person, but I feel a little better about myself. Doing more “right” and “good” than, even unintentional, wrong. Considering more before acting. Appreciating when other people/horses do not feel physically or mentally able to do things. Worrying less if other people disapprove of me. And maybe cutting them and myself a little more slack. After all, nobody’s perfect, especially not me. Yes, Sixty’s not too far off, but bring it on. I think I’m ready. I’m All Grown Up now (or very nearly). If you’ve got over a difficult time in your life and feel it’s improved you as a rider and an all-round human being I’d love to hear about it. I always welcome readers’ comments …..
It’s not hard to guess if and where my sweet-itchy horse is itching. As soon as he sees me he will either plonk that part of himself directly in front of me or point to it with his nose. Though he’s an acrobatic individual who can scratch the top of his own tail with his teeth, he’s used to me doing the scratching with a plastic brush or applying one or other of his lotions and potions (there have been more than a few as you probably know) as I try my best to keep his mane, tail and coat intact. Commenting on my “Zebra” post, Sara Annon kindly suggested a new line of inquiry, threadworms in the nuchal ligament as a possible cause of itching. And as Pom continues to be itchy even through winter I’m checking it out. Aha, something new to worry about, but also a possible explanation for the everlasting itch! In the meantime, Pom’s seemed no better recently, so I reckoned he might have a build up of product and, as the weather is very mild, could do with a New Year freshen up. So, Pom had a thorough shampoo of mane and tail, rinse and towel-dry, enjoying the massage, but, as I didn’t want to turn him out still damp underneath his daytime cover, I thought I’d introduce him to the hairdryer. Ever so gently. We targeted, clicked and rewarded, demonstrated it working, on low, on me and little by little gave his mane and neck a gentle blow dry. I didn’t insist, as it wouldn’t make sense to mix electrics with a frightened horse, but it touches me to see how much he will trust me now in most situations. As I say, he’s no fan of water, showers are tolerated, and, out on rides, puddles are never crossed without a good deal of persuasion. I watch in awe as cross-country eventers flip through those water jumps with ease, but I don’t think my life, or his, will be long enough for me and Pom to do anything of the sort! 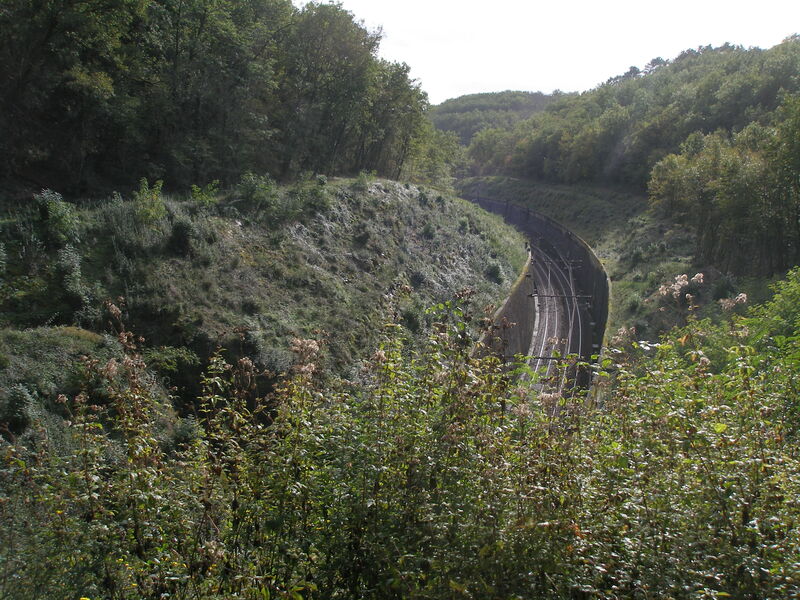 The Paris-Toulouse train line passes through a tunnel about a mile from us and we have to pass high over the tunnel mouth, alongside a deep cutting which has recently been revealed in all its scariness since a tree-cutting gang left it fully exposed. 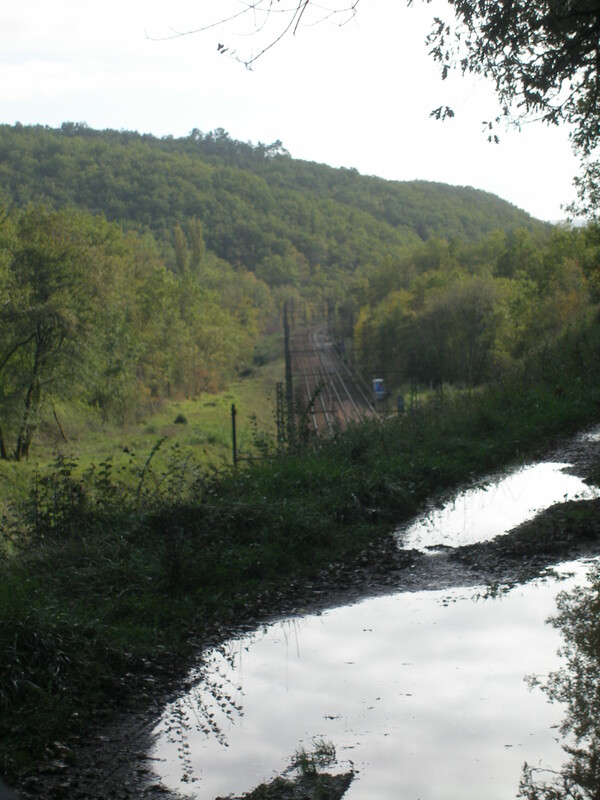 Should we deviate from the track, there is one mighty steep drop down to the railway line. Recently, we’ve had enough rain to keep the puddles topped up so we faced a devil-or-the-deep-blue-sea choice. Walking in water didn’t seem so difficult after all!